There are so many great reasons to ride your bike: It offers fun, freedom and exercise, and it's good for the environment. We want kids and families to ride their bikes as much as possible. Here are a few tips so that you'll be safe while you do so. 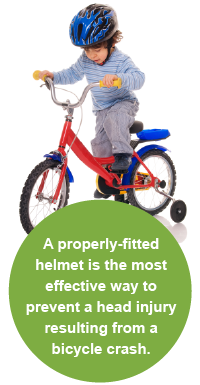 Properly-fitted helmets can reduce the risk of head injuries by at least 45 percent – yet less than half of children 14 and under usually wear a bike helmet. Wear a properly-fitted helmet. It is the best way to prevent head injuries and death. Ride on the sidewalk when you can. If not, ride in the same direction as traffic as far on the right-hand side as possible. Use hand signals and follow the rules of the road. Be predictable by making sure you ride in a straight line and don’t swerve between cars. Wear bright colors and use lights, especially when riding at night and in the morning. Reflectors on your clothes and bike will help you be seen. Ride with your children. Stick together until you are comfortable that your kids are ready to ride on their own. The ride is just beginning. Check out more bike safety tips. Find toolkits and resources to help you be an advocate to improve your school zone.